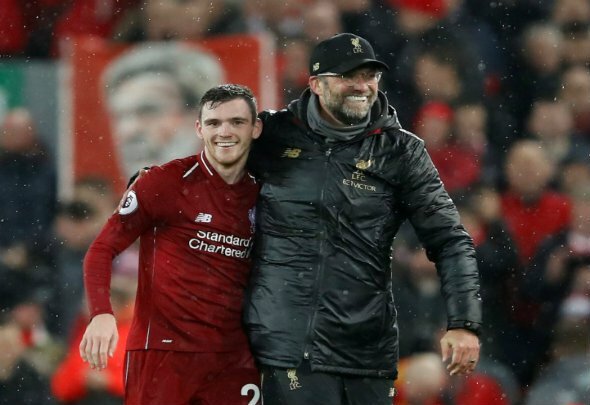 Liverpool manager Jurgen Klopp just smiled when Andy Robertson slipped against Chelsea during their 2-0 win against the Blues, according to the Times. The newspaper claim on their website that the German manager had a sly smile on his face when the Scottish defender lost his footing in the second half, with the full back’s error reminiscent of Steven Gerrard’s infamous moment against the Stamford Bridge outfit in 2014. Unlike the Anfield legend, who saw Demba Ba go on to score what turned out to be a crucial goal in the title race, Robertson was not punished by Chelsea and managed to recover to help his side keep a clean sheet and move back to the top of the table. You could not write it if you tried. With the game being another case of Chelsea playing Liverpool with the Reds chasing the Premier League title, much of the pre-match focus was on Gerrard’s famous moment five years ago. This time around it was Liverpool who won 2-0 but Robertson’s almost identical replica of the slip will have stood out as an unusual highlight – if that is the right phrase – of the victory. It was uncanny the way the Scottish international managed to lose his footing not only in a similar fashion to Gerrard but in nearly the exact same place on the pitch. Klopp might have been left smirking but you can be sure he would have held his head in his hands had it ended up having the same result Gerrard’s did. Football has a tendency to throw up such irony and it did not disappoint on Sunday afternoon.